Design and create your own bespoke labels with this range of high quality professional sheet labels. Available in a choice of face and backing materials all of which offer exceptional stability. 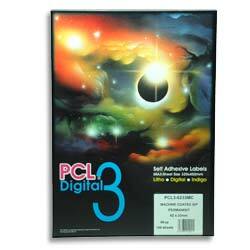 PCL3 Digital® flat sheet labels are specifically designed for maximum stability and simplicity of use on SRA3 Digital presses such as HP Indigo, Kodak NexPress, Xerox iGen, Docucolor, Canon, OCE, Konica Minolta and other sheet fed SRA3 digital presses. This SRA3 range of flat sheet labels is equally at home on Indigo, Digital, Litho presses and hot fusing toner (laser "digital") printers. Excellent for applications where durability and water resitance is required. Equally at home on Indigo, Digital, Litho presses and hot fusing Laser toner printers.